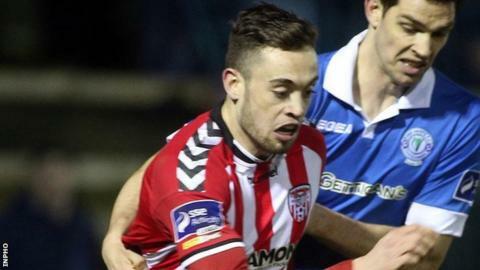 Derry City substitute Nathan Boyle came off the bench to score his first goals for the club and earn a dramatic win over Galway United at the Brandywell. Kevin Devaney had taken advantage of poor defending to tap home his second goal of the season in the 24th minute. Boyle fired in the equaliser 15 minutes from time and snatched victory with a left-foot finish in stoppage time. The Candystripes have now won three league games in a row and are one of five teams joint top of the table. The visitors went into the match unbeaten in their three opening fixtures of the campaign and looked set to extend that run until Boyle's late intervention. Derry manager Kenny Shiels fielded an unchanged line-up for the third successive game as he hoped to build on clean sheet victories over Cork City and Bray Wanderers, following an opening night defeat by Finn Harps. Devaney opened the scoring with a right-foot shot past Ger Doherty at the back post after Gary Shanahan had squared the ball across goal. Former Derry player Enda Curran almost caught Doherty off his line before half-time while the home keeper saved from Shanahan's glancing header. For the home side, Gareth McGlynn saw his free-kick tipped over by Conor Winn, who also denied Barry McNamee. A well organised Galway side looked to be running out comfortable winners until Boyle levelled, and Winn produced a fine stop from Josh Daniels, who was also seeking his first goal for the club. Boyle then latched onto a loose ball and unleashed a stunning effort to secure victory. Derry are joined by Cork City, Dundalk, St Patrick's Athletic and Shamrock Rovers on nine points at the summit of the Premier Division.